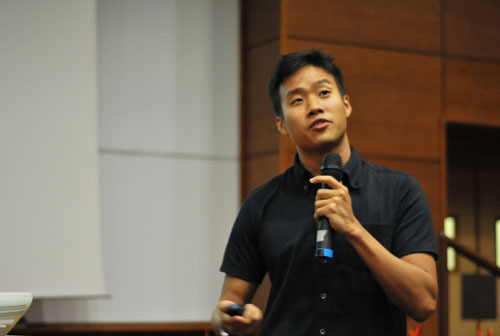 DBS Graduate Cedric Tan wins biology category in Science’s 4th Annual “Dance your PhD” contest! Cedric did his final-year project in my lab. This will surprise nobody who knows him! We should assess LSM2251 like this! Science’s fourth annual “Dance Your Ph.D.” contest, a competition that recognizes the best dance interpretations of scientific doctoral work. The Ph.D. research of the three other winners, who will receive $500 each, made for equally compelling dances. 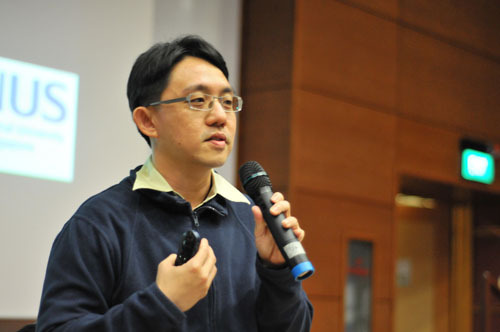 Cedric Tan, a biologist at the University of Oxford in the United Kingdom who won the biology category, depicted the mating dance of the fruit fly, capturing the way that male flies stalk and sniff females. He also incorporated his research on how choosy females prefer to mate with flies that are brothers and how that relation reduces violence between the males. Dance your PhD 2011: Smell mediated response to relatedness of potential mates from Cedric Kai Wei Tan on Vimeo. Plus see Cedric’s illustrious NUS history here. The news made it to Slate too! The Biodiversity of Singapore Symposium III held in NUS on 24 Sep 2011 was organised by the Raffles Museum of Biodiversity Research (NUS) and the National Biodiversity Centre (NParks) as a platform for the public and students to be updated on the biodiversity and nature community. It also served as an opportunity for the community to meet up and exchange and discuss ideas on biodiversity in Singapore. This time, the theme is “The Next Generation”, and various emerging members of the community in various sectors were featured as speakers, along with more seasoned personalities. A large number of the NUS Biodiversity Crew were speakers or chairs in various sessions divided into Community Impressions and the key habitats found in Singapore: 1) Terrestrial, 2) Freshwater and 3) Marine. Community Impressions kick started the symposium proper after a speech by guest-of-honour, Minister of State for National Development and Manpower, Brigadier-General (NS) Tan Chuan-Jin and presentation of symposium awards. This session gave a review and raised issues regarding the terrestrial, freshwater and marine ecosystems in Singapore and was chaired by Dr Zeehan Jaafar. 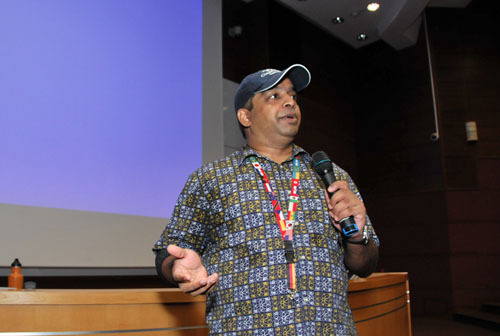 BOSS III organiser and DBS lecturer, Siva kick started the Community Impressions with voices from the ground regarding terrestrial issues namely the regulation of visitor impact to Bukit Timah Nature Reserve as well as looking beyond culling as a management practice for human-wildlife conflict. 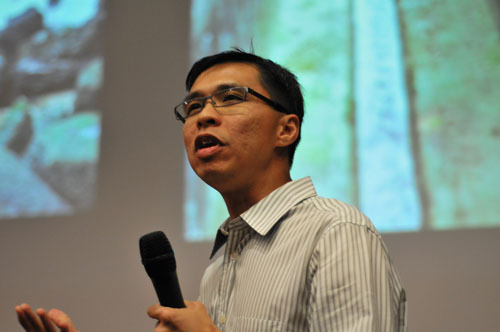 Assoc Prof Darren Yeo represented the freshwater community and talked about the gems of Singapore’s freshwater habitats as well as the challenges, including habitat loss and modification, exploitation and introduced species. The terrestrial session featured two graduate students from the NUS Biodiversity community and chaired by alumni Yong Ding Li. 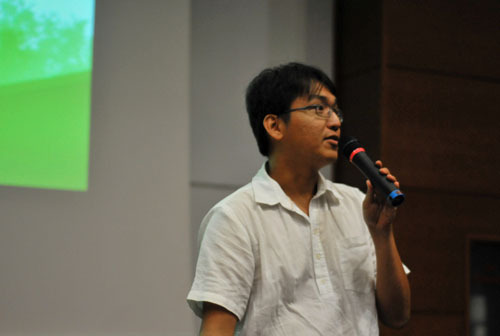 Phd candidate, Chong Kwek Yan from the Plant Systematics Lab talked about “Why would anybody want to be a botanist in Singapore?” He talked about how the lab has moved on from being a producer of plant systematics research into being end users in Singapore. Various ongoing research in the lab were also highlighted. 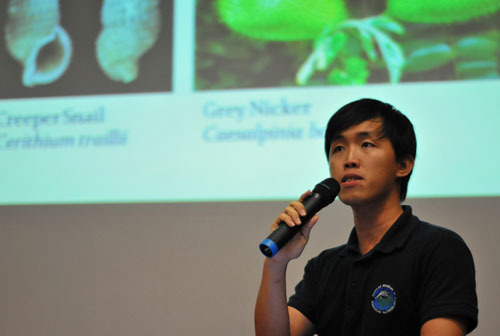 Mammal researcher Marcus Chua from the Systematics and Ecology Lab gave an account of mammal research in Singapore and how current research has changed to reflect the issues such as existing status, conservation and co-existence of mammal species in Singapore. Maxine Mowe and Adam Quek from NUS, chaired the freshwater session, which featured amongst two members of the research community from NUS. Chong Jun Hien from the Tropical Marine Science Institute talked about freshwater macro-invertebrates, their relationship with the environment and how they can end up in our soup. 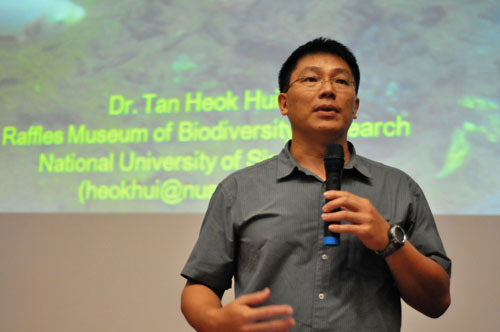 He also introduced the concept of biological monitoring for freshwater environments in Singapore to measure water quality. 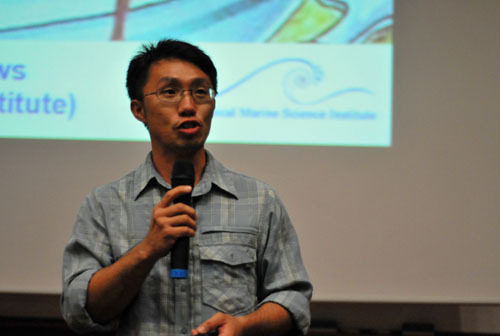 Dr Tan Heok Hui, a lecturer based in RMBR and managing editor of the Raffles Bulletin of Zoology, talked about non-native fish species in Singapore and the need to understand the ecology of these fishes to understand how they interact with our environment. The marine session, chaired by graduate student, Alison Wee and Nanthini Elamgovan from NParks, featured a bumper crop of three speakers from the Biodiversity crew. Soo Wai Kit from the RMBR Education Unit spoke about Project Semakau, a community-based monitoring and conservation project on the world’s first landfill island. Wai Kit shared about the new discoveries, records and findings from the project as well as how volunteers helped to make this possible. 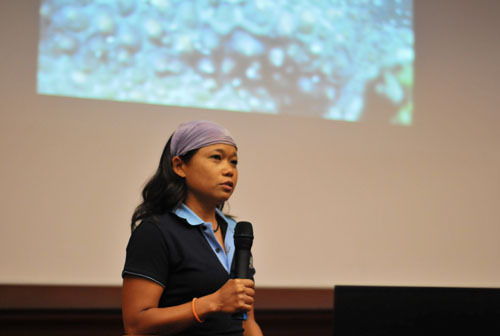 Karenne Tun from the Marine Biology Lab spoke about the rich coral reef life abound in Singapore’s waters and the ongoing research efforts to study this diverse ecosystem. She delighted the audience with stories about coral spawning so much that even moss man, Adjunct Assoc Prof Benito Tan got interested during the Q&A session. Post-doctoral research fellow Dr Dan Friess from the Applied Plant Ecology Lab delivered the last talk of the day on Mandai mangroves, the multitude of research that has taken place there and challenges that threaten the future of the mangrove patch. 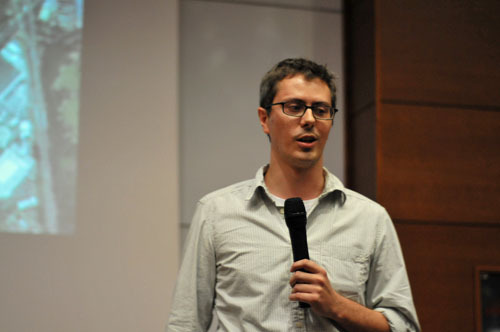 Dan also spoke of the ongoing effort to map and study the effect of sea level rise on Mandai mangroves. In a special session, Dr Tan Swee Hee gave an update on the Lee Kong Chian Natural History Musem project that he is overseeing. He spoke about the three diplodocid dinosaurs funded through public donations and unveiled plans for the new natural history museum. Food was catered and the extra long tea breaks (1 hr each) allowed plenty of time for meeting, chatting with attendees and viewing of the posters put up by students and nature groups. The Raffles Museum of Biodiversity Research set up a mobile store selling mechandise and the Toddycats! and NParks also had an on-site exhibitions on the biodiversity of Singapore. Judging from the response, the ‘crew certainly enjoyed sharing about their work with the community at BOSS III and making new friends at BOSS III and are definitely looking forward to the next Biodiversity of Singapore Symposium! All photos kindly taken by Kenneth Pinto. A quantitative assessment of arboreality in tropical amphibians and reptiles across an elevation gradient: can arboreal animals find above-ground refuge from climate warming? Abstract – Tropical rainforests contain some of the richest biological communities on earth. One crucial structural component of tropical forests is canopy trees. Considered the “next frontier” to biological inquiry, forest canopies are suspected to be among the most species-rich yet highly threatened terrestrial habitats. However, the difficulty of accessing canopy trees has left arboreal communities largely neglected from ecological study. Little is known as to how much of above ground habitat is used by animals, particularly highly cryptic animals such as amphibians and reptiles. The ecological importance of these habitats to animals has not been ascertained. I present the first ever quantitative assessment of arboreal habitat use by amphibians and reptiles in the tropics. Specifically, I conducted research on Mt. Banahao, central Luzon, the Philippines (900 to 2100 m) to examine how amphibian and reptile communities structure vertically in a rainforest and how community arrangement in the forest stratum changes across an elevation gradient. Many canopy dwelling animals will likely be threatened by human induced climate change. Thus, I examine ecotypic thermal tolerances of amphibian and reptile communities both within the forest stratum and along an elevation gradient. Lastly, I examine whether cool refuges are present in the forest canopy. Specifically, I examine whether birdnest ferns (Asplenium complex), a major structural component of forest canopies in Southeast Asia, serve as obligate breeding habitat and cool thermal refuge for arboreal frogs. My study contributes unique ecological data on some of the least known animal communities on earth. 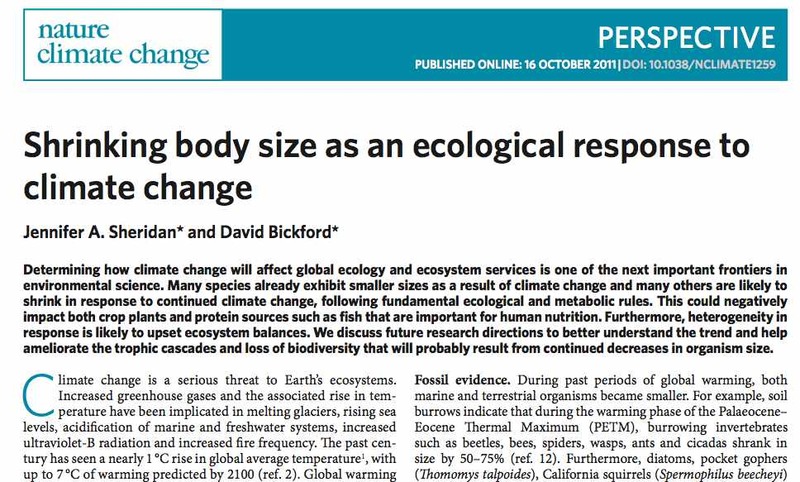 In the wake of human caused climate change and synchronous species extinctions, understanding how all species respond to climate warming is essential for tangible conservation.